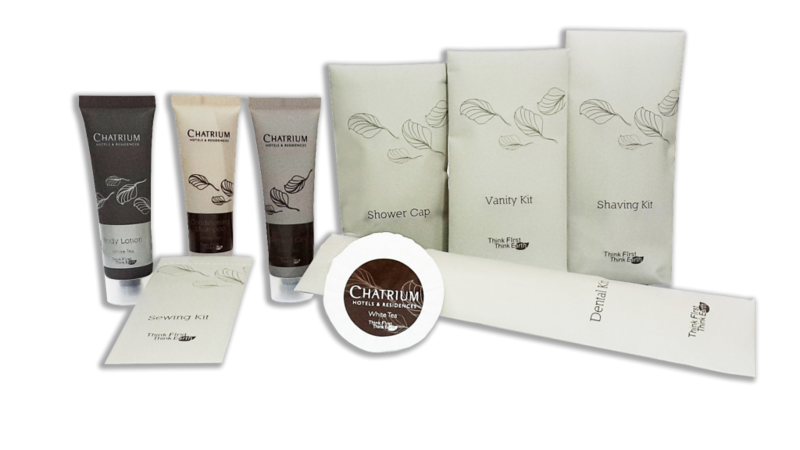 Bangkok, January 2015: Chatrium Hotels and Residence introduces the latest carefully crafted environmental collection of guest room amenities for the properties in Bangkok and in Yangon in an effort toward increased environmental friendliness. Our “Tree Free” packaging is made from stone paper, an ultra-sustainable and eco-friendly paper-like material made from stone remains. It is earth friendly, energy efficient and acid free. In addition, all accessory items are packaged in biodegradable tubes and sachets that have been carefully selected and manufactured with d2w® controlled-life additives which are environmentally friendly and sustainable. Packaging of accessories is made from Stone Paper and printed in Soy-ink. Dental Set is comprised of a biodegradable toothbrush, made from d2w Oxo-biodegradable plastic, wrapped in a stone paper bag. Shower cap is fully degradable and made from d2w Oxo-biodegradable plastic. Shaving kit is composed of a biodegradable razor, made from d2w Oxo-biodegradable plastic, and a shaving cream tube developed from biodegradable plastic. All items are packaged in a stone paper bag. Vanity kit is 100% biodegradable, made of cotton pads, and paper based cotton tips. Sewing kit is made from biodegradable components. All accessory items are manufactured with d2w® controlled-life additives which will degrade to carbon and water within 36 months once disposed in a landfill.